We completed our run up Hole in the Rock road and spent the night at a place called Spencer Flats outside of Boulder, UT. It was quite windy so the blowing dust made campfire activities uncomfortable. In the morning, the group broke up: Rob and Vince headed south along the Burr Trail; Chris and Mark headed toward I-70 along the paved road. 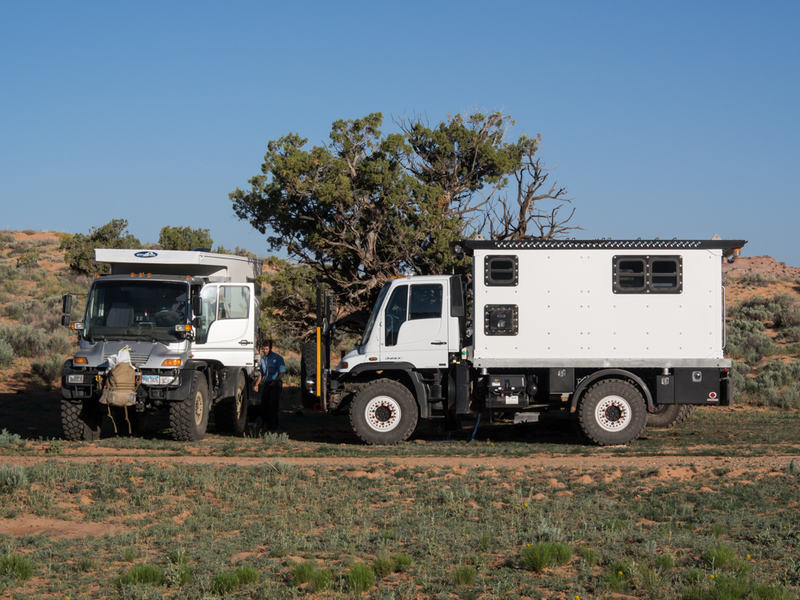 We stayed behind to address a couple minor mechanical issues and then headed into Boulder, UT for a partial resupply. I say partial because we could not get all of what we needed. We did, however, get diesel, ice and fresh water. 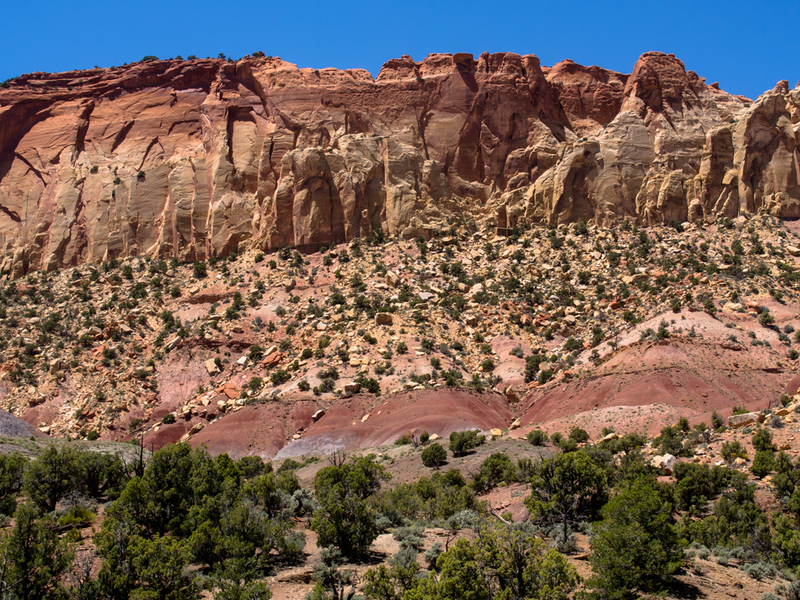 After great lunch at a local cafe, we headed down the Burr Trail to Capital Reef National Park. 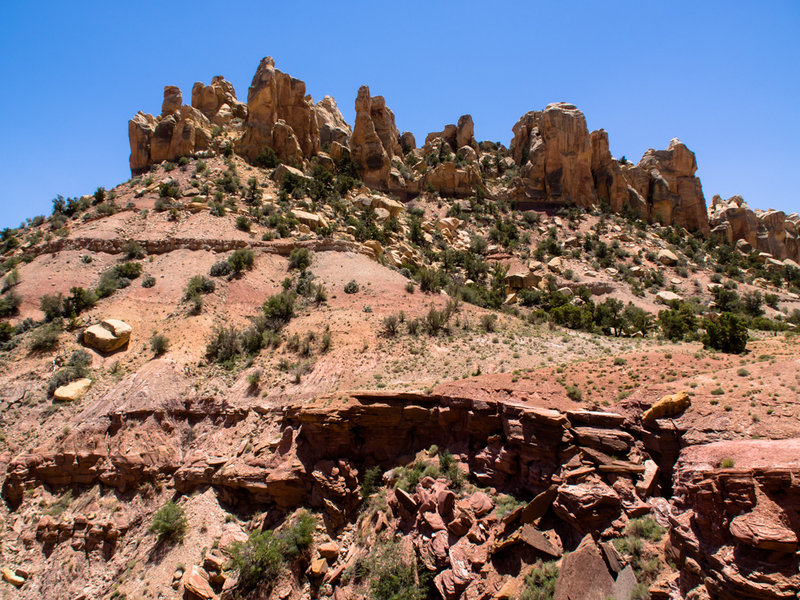 We had been to Capital Reef before so we knew what to expect. To the west of our campsite at Spencer Flats was a nice sandstone monolith formation. Group members were busy packing for departure. Above (left) is Chris' rig and right is Vince's longer wheelbase U500. 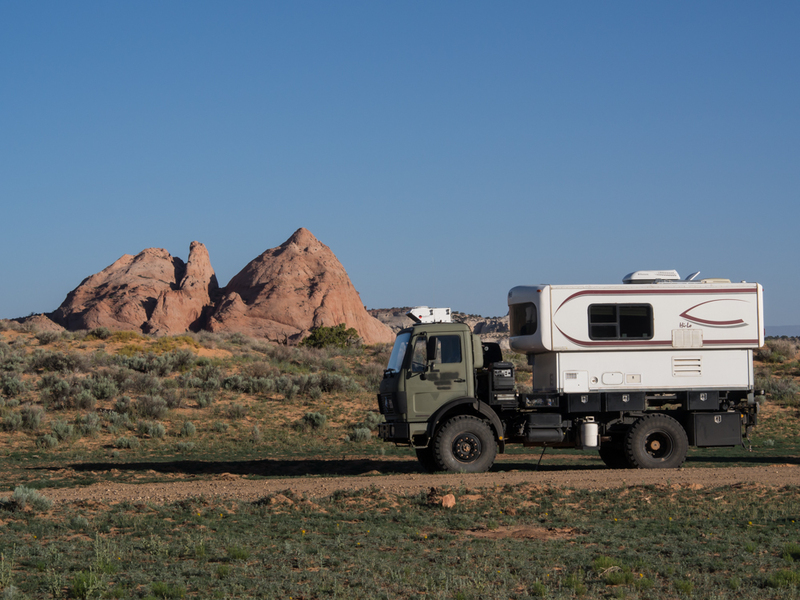 Our truck, Thor, with the monolith in the background. Mark and Gail's GVX U500. 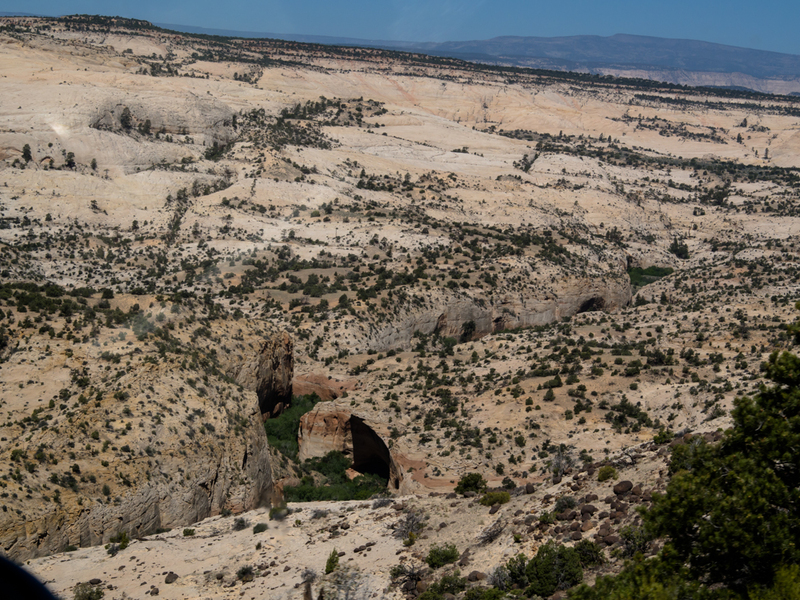 Calf Creek carved an awesome canyon that was visible from UT-12 as it traverses Hell's Backbone. 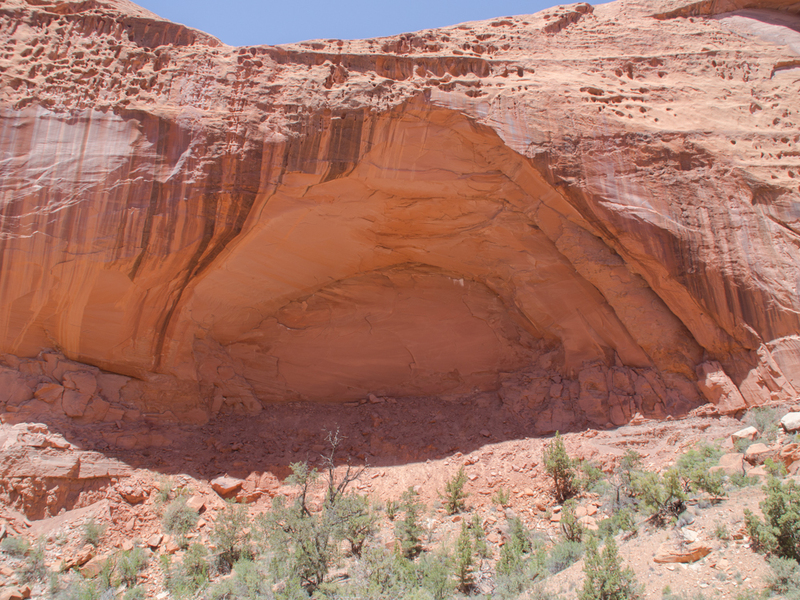 Several of the alcoves carved by Calf Creek were world-class. We got diesel, ice, fresh water and lunch in Boulder and then headed down the Burr Trail. Visible were huge monoliths with complex exposed bedding. 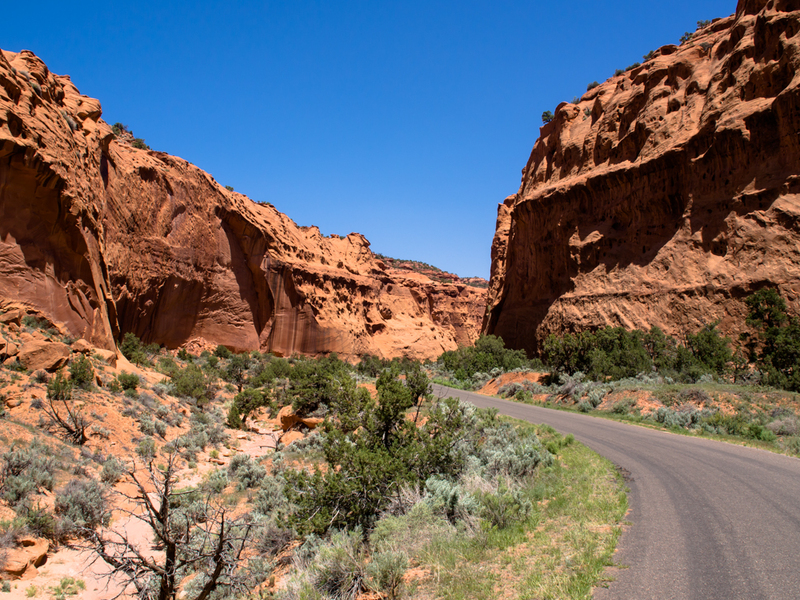 The road goes down a narrow canyon surrounded by high sandstone walls. This large alcove was right next to the trail. 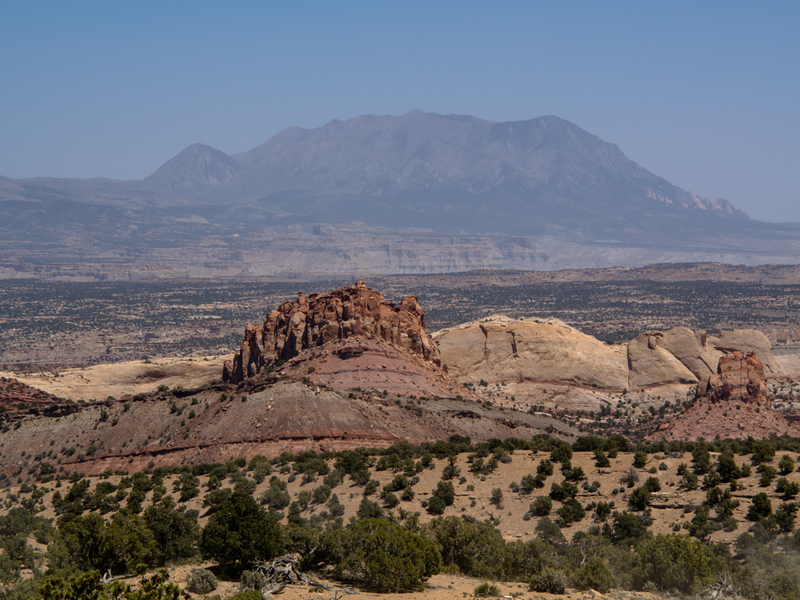 This dramatic view presented itself before the road descended into Capital Reef. The colors in the rocks were vivid and bright. 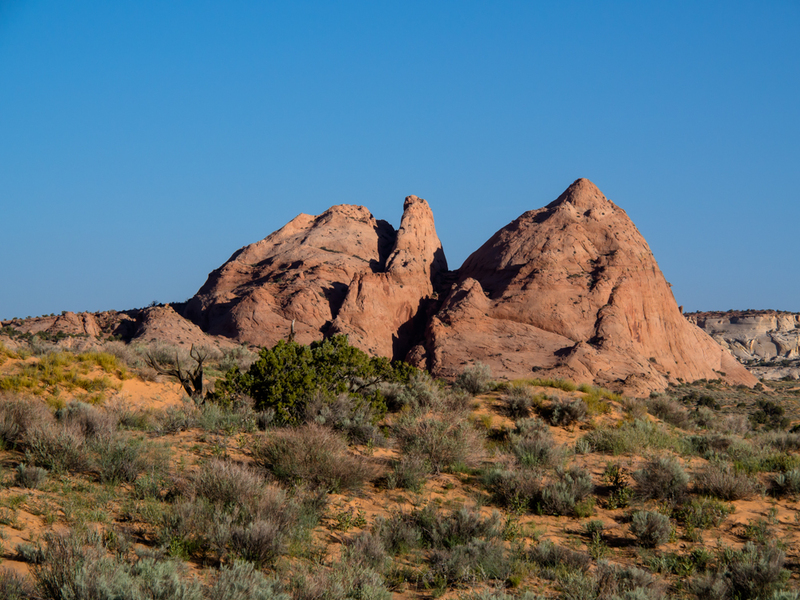 The cap rock had been eroded into multiple pinnacles and hoodoos. 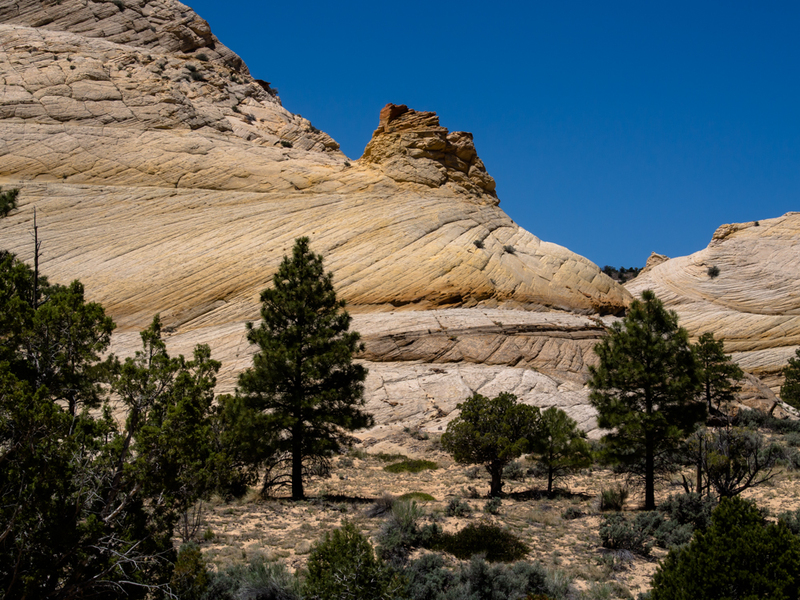 The cap rock formations had interesting wind erosion cavities. The fault that produced this cliff ran for more than 30 miles. 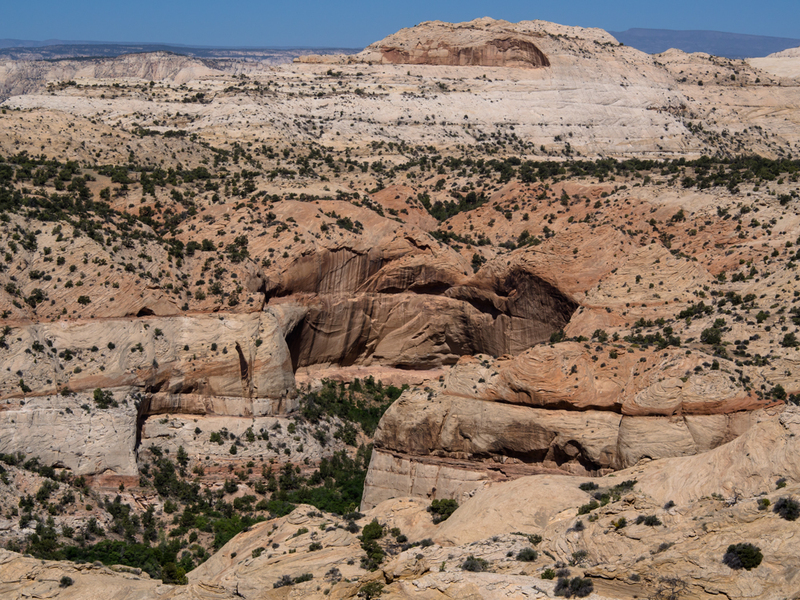 The Waterpocket Fold monocline resulted in a long, nearly straight line of large cliffs. Visible in the distance are the Henry Mountains. 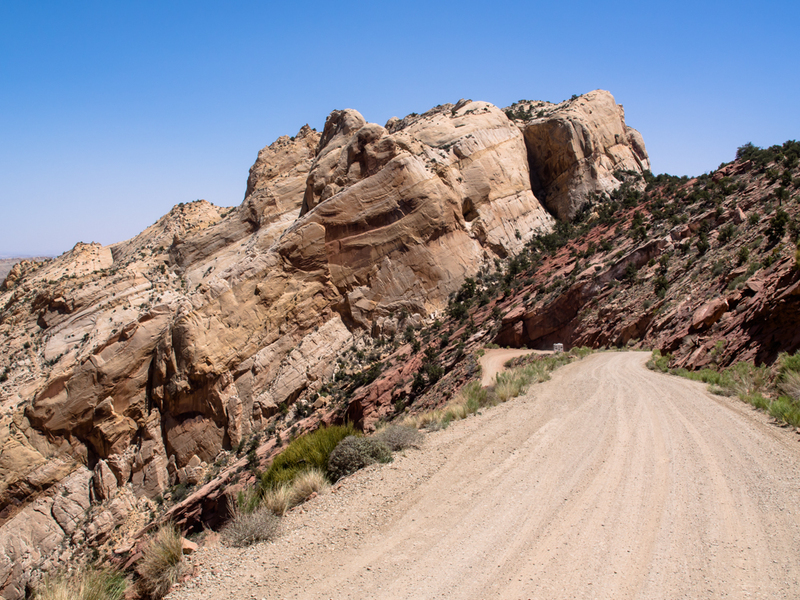 These ridges mark the start of the descent into Capital Reef via the Muley Twist grade. 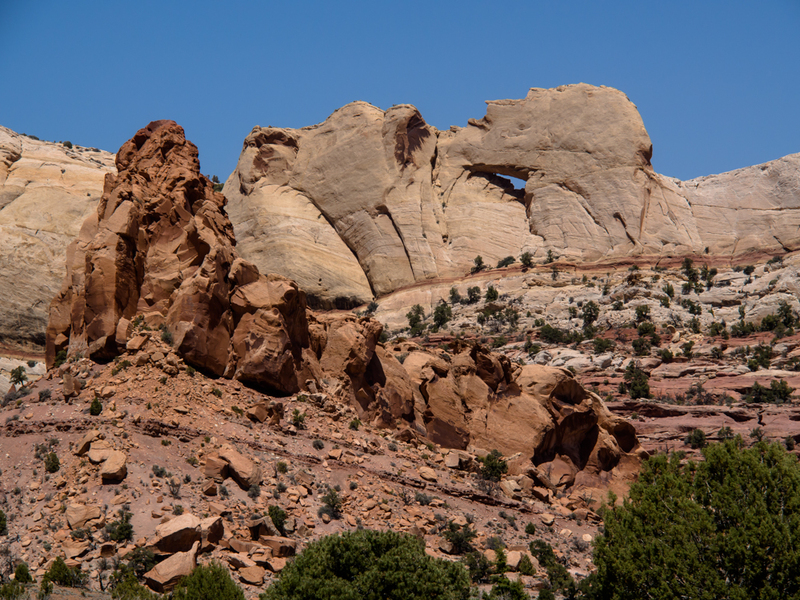 We noticed a window in the cliff behind a large sandstone pinnacle. 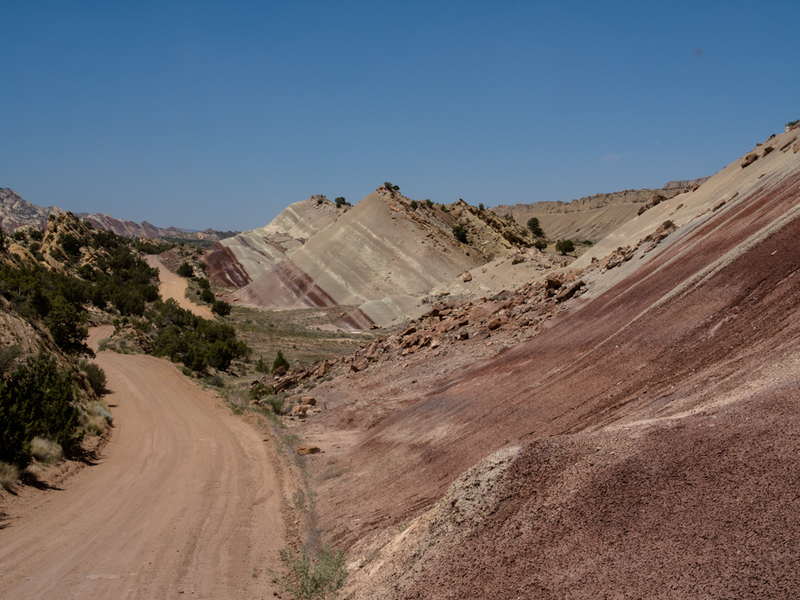 The road goes right down the face of the monocline. 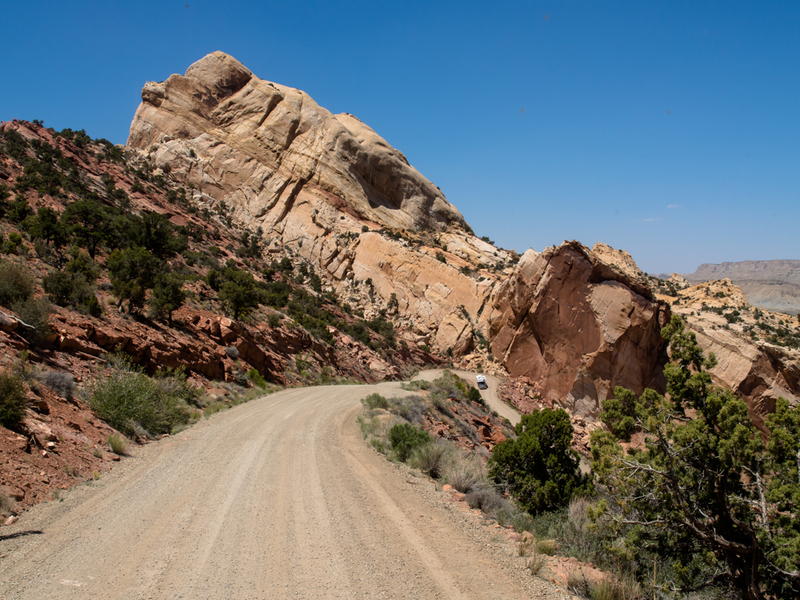 The grade of the road is about as steep as the angle of the monocline. 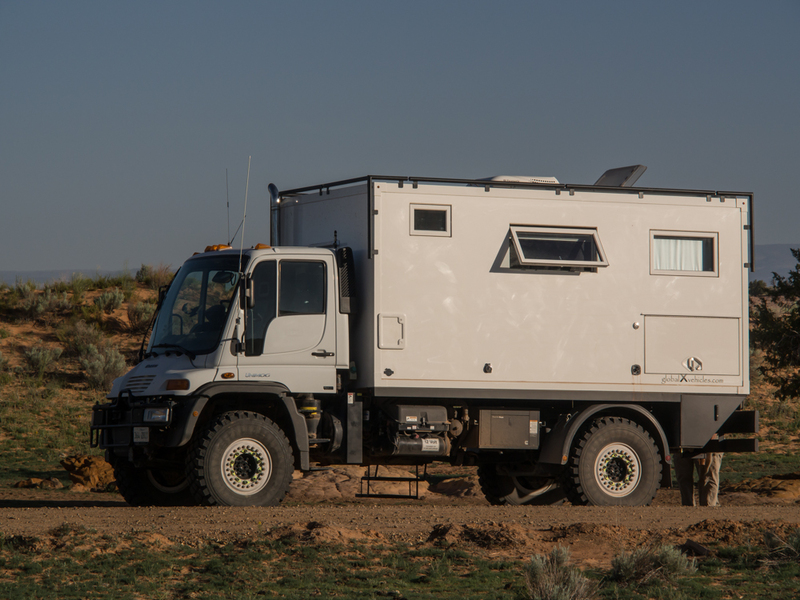 Note the camper has completed the first switchback. We were down to 2nd gear and used the exhaust brake for nearly the entire descent. The road goes through the notch in the cliff. 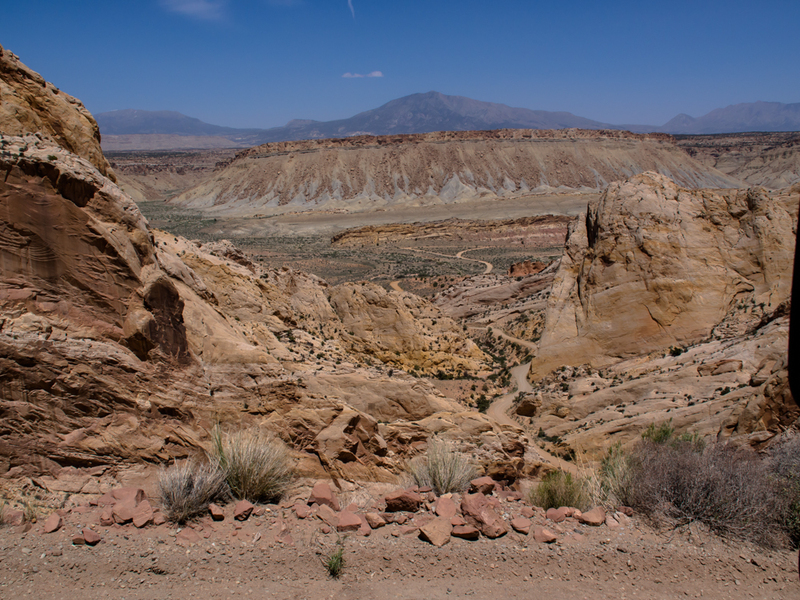 The lower reaches of the Burr Trail are visible at the bottom of the canyon. 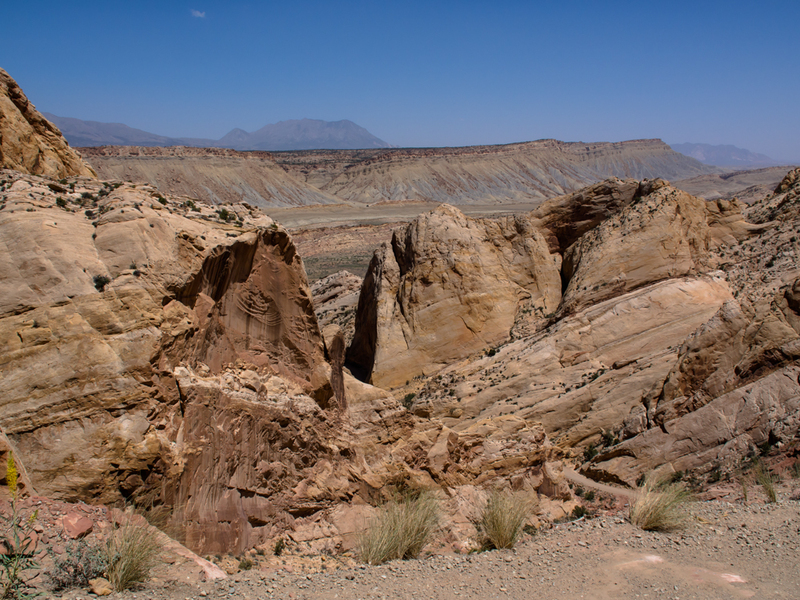 When we hit the junction at the base of the Muley Twist, we turned north and traveled along the face of Waterpocket Fold for about 30 miles before we took a side road into a canyon to find a place for the night. 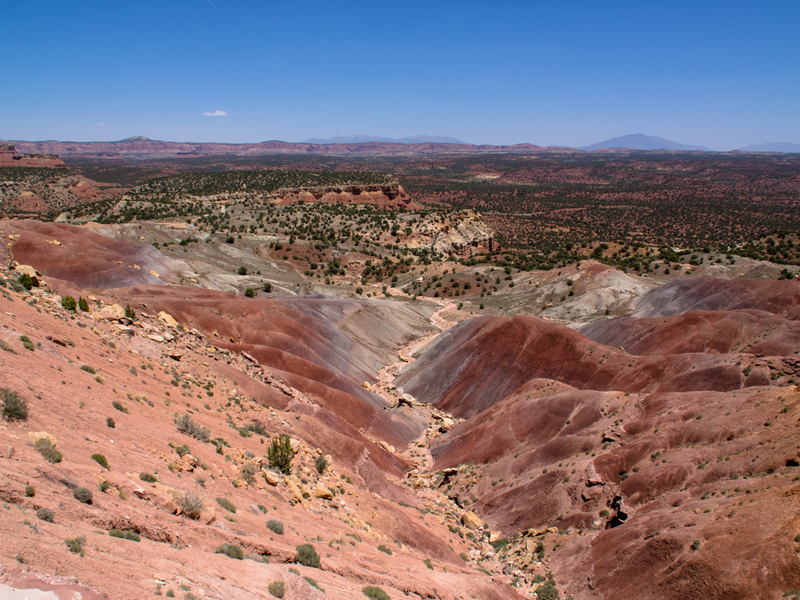 The bottom of Waterpocket Fold had colorful formations exposed by erosion of the monocline. The area around Boulder, UT is magic. 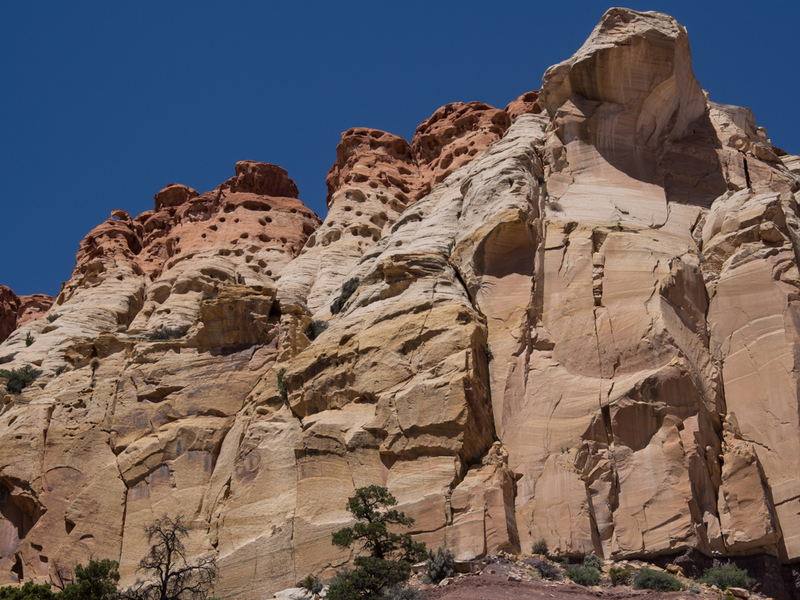 The exposed sandstone monoliths create a surreal feeling. 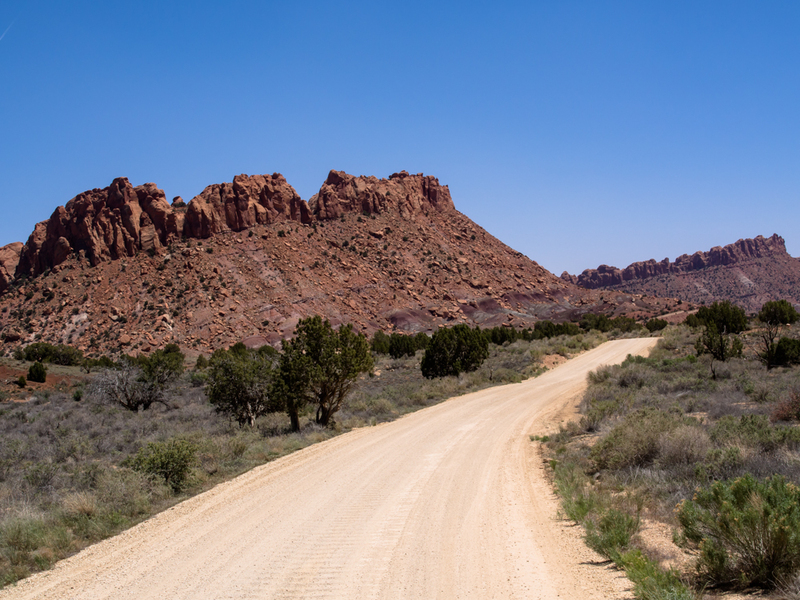 Capital Reef is remote with many dozens of dirt roads, but the views are worth the dust and washboards. Next: Loa, UT for supplies then into the goblin zone near the Dirty Devil river.